Dabo Swinney, Nick Saban, Lincoln Riley and every other head coach in three of the five major conferences will be called to the podium this week to discuss the preseason's most fascinating topics. Here's what we want to know, plus sandwich rankings, Russian dumplings in Wisconsin and the rest of this week's Punt, Pass & Pork. Welcome to Talking Season, when everyone is undefeated and no question is too silly. For the past few years, the SEC has dominated the early college football conversation by holding its media days a week earlier than any other Power 5 league. This year, the league is moving media days from Hoover, Ala., to Atlanta. So you can no longer find your favorite sportswriter eating Chick-fil-A waffle fries in the food court of the Riverchase Galleria. The SEC also has competition this year. For the first two days of its four-day extravaganza, it will share the stage with the Big 12. On Wednesday and Thursday, the ACC will take a share of the spotlight. So with three Power 5 leagues holding gabfests this week, it’s time to preview the most pressing questions at each event. To Alabama coach Nick Saban: So who is starting at quarterback? We started asking this question while confetti fell at Mercedes-Benz Stadium. Once Tua Tagovailoa brought the Crimson Tide back from a 13–0 halftime deficit and threw a 41-yard touchdown pass in overtime to cinch a 26–23 win, this became the single biggest question of the offseason. Would Tagovailoa or incumbent starter Jalen Hurts be the starter when Alabama opens the season against Louisville in Orlando on Sept. 1? Unfortunately, we’re probably not going to get an answer from Saban on Wednesday in Atlanta. He has historically taken his quarterback competitions into the season, and Tagovailoa’s hand injury limited him too much during spring practice for Alabama coaches to hold a head-to-head competition. Hurts’s father has said Hurts would be the most sought-after free agent in college football history if he decided to transfer, and when Averion Hurts made those statements in April, it seemed Saban would have to make a choice before the season opener. But since the NCAA’s Division I Council passed a new redshirt rule in June that allows players to play in up to four games and still redshirt, Hurts absolutely can take this competition into the season without risking losing a year of eligibility. Saban could drop a bomb, but that seems unlikely. He’ll get this question in some form or fashion, but he can easily deflect it because he has time to make a decision. Still, expect Saban to most forcefully use the word “Aight” during his answer to this question. More than likely, he’ll use his time on the microphone to make the case for a rule he’d like to see tweaked or changed. If he refers to the NCAA’s new headset rule as “mouse manure” again, that would be a treat. To Georgia coach Kirby Smart: How do you replace Roquan Smith, Sony Michel, Nick Chubb, Isaiah Wynn, Davin Bellamy, John Atkins and the rest of the veterans who provided the leadership for last year’s SEC champs? Smart probably has some idea how to answer this question after an offseason spent evaluating a less experienced but still talented roster, but he may not be quite ready to name names. The Bulldogs have the raw athleticism to replace most of these players. (Even though the other players were bigger names, the contributions of 6'3", 321-pound nose tackle Atkins may actually be the toughest to replicate.) The question is whether they’ll have the kind of leaders who can rally the team when it faces a difficult game. This group, which features an excellent offensive line and a second-year starter at quarterback (Jake Fromm), should have those intangibles fully developed by later in the season. But will it be ready Sept. 8 when Georgia plays at South Carolina—which looks like its toughest challenger for the SEC East title? To all the coaches: Who will have the longest opening filibuster—and can we just skip it? In 2017, LSU coach Ed Orgeron’s fourth SEC Media Days—he had three as the Ole Miss head coach from 2005 to ’07—began with a 2,640-word soliloquy that dove headfirst into the Tigers’ depth chart. This was topped by then–Ole Miss coach Hugh Freeze, who went for 2,773 words. That made more sense. Freeze was going to get peppered with questions about NCAA penalties that wouldn’t be revealed for months. Plus, word had begun to leak behind the scenes about the phone records that ultimately cost Freeze his job. Some coaches will use their opening statement to announce some news or reveal their silly motivational slogan for preseason camp. And that’s fine. But when a coach is obviously speaking to fill the time and reduce the number of questions he’ll face, it’s time to cut him off and bring on the queries. This is the guy from Touchdown Alabama Magazine’s time to shine. Don’t take that away from him with your filibuster. To Oklahoma coach Lincoln Riley: Will the defense be better? A historic season from quarterback Baker Mayfield and the Oklahoma offense propelled the Sooners to the Rose Bowl, but a porous defense ultimately undid Oklahoma and cost it a shot at the national title. Coordinator Mike Stoops’s unit finished No. 82 in the nation in yards per play allowed (5.8). That ranked seventh out of 10 in the Big 12. The only defenses that were worse were Kansas, West Virginia and Baylor. Kyler Murray has the tools to run Riley’s offense well, but it’s a big ask to expect Murray, tailback Rodney Anderson and company to put up the kind of numbers the Mayfield-led offense did. Few quarterbacks in college football history have had seasons anywhere near as good as Mayfield’s 2017. That means the defense needs to pick up some slack if Oklahoma plans to stay atop the Big 12. Perhaps the cornerback tandem of Parnell Motley and Tre Norwood has improved after getting thrown into the fray last season. Perhaps defensive end Kenneth Mann can replace the disruption Obo Okoronkwo caused last season. Perhaps some of the freshmen (safety Brendan Radley-Hiles and defensive end Ronnie Perkins, for example) can contribute immediately. If the defense gets better, it’s easy to imagine the Sooners winning the league for a fourth consecutive season and returning to the playoff. If it doesn’t, Oklahoma might finally be vulnerable in the Big 12. To West Virginia coach Dana Holgorsen: Same question as the one for Riley. The Mountaineers are going to score points. Quarterback Will Grier is going to pile up passing yards, and receivers David Sills V and Gary Jennings are going to post huge numbers. But if West Virginia coordinator Tony Gibson’s defense can’t make a meaningful contribution, a November stretch that includes consecutive games against Texas, TCU, Oklahoma State and Oklahoma will keep the Mountaineers from competing for the Big 12 title for the first time since joining the league. Linebacker David Long will provide leadership and sure tackling, but the line in front of him and the secondary behind him are bigger question marks. It’s the Big 12, so no one is expecting shutouts. Still, the Mountaineers must force more turnovers than the 19 they forced last year and sack the quarterback more than the 24 times they did last year. Zeke Rose led West Virginia last year with five sacks. He’ll need to boost that number, and he’ll need someone else to help him harass quarterbacks. Because if West Virginia’s opponents get time, they might put up numbers like West Virginia’s offense does. To Texas coach Tom Herman: This feels like an unusual question to ask in the Big 12, but can your offense catch up to your defense? Defensive coordinator Todd Orlando’s group had a shaky start last season against Maryland but evolved into a formidable outfit by season’s end. The problem? After injuries thinned the offensive line to the breaking point, the Longhorns couldn’t move the ball and kept putting the defense in horrible predicaments. Herman probably isn’t going to reveal a preference between quarterbacks Sam Ehlinger and Shane Buechele, but he’ll likely highlight a deeper line that should be able to continue to function even if a few injuries hit. Elijah Rodriguez, who is capable of playing center, guard and tackle, missed all of the 2017 regular season before returning to play in the Texas Bowl. Guard Patrick Hudson hurt his knee in September and missed the rest of the season. Both should be back to join center Zach Shackelford and guard Patrick Vahe. Meanwhile, Rice graduate transfer Calvin Anderson will compete at one tackle spot. The Longhorns have enough talent at the skill positions to compete in the Big 12, but Texas can’t take the next step until the offensive line gets better. New position coach Herb Hand and his players hold the key to the Longhorns’ season. To Clemson coach Dabo Swinney: Will what happened in 2014 inform how you handle your quarterback competition? In 2014, it was obvious to everyone at Clemson that Deshaun Watson was the quarterback of the future, but Swinney and his staff opted to start Cole Stoudt and bring along Watson slowly. Watson looked ready during a few series against Georgia in the season opener, and he eventually supplanted Stoudt during the Florida State game in Week 3. Still, Clemson lost that game in Tallahassee in overtime. A win likely meant an ACC title. Had Watson started that Florida State game, it probably never would have gone to overtime. Clemson’s roster is ready to compete for a national title. The defensive line might be the one of the best in college football history. The pieces are in place. So who will Swinney choose to lead the offense? He keeps saying that if the season started today, Bryant would have the job. He’ll probably say that again this week. But will he say that come September? To Miami coach Mark Richt: Is the U back? Just kidding. But is Miami ready to take another big step? The Hurricanes won the ACC Coastal but lost their regular-season finale at Pittsburgh and then looked far below Clemson’s level in a 35-point ACC title game loss. The Clemson game wasn’t representative of what the Hurricanes were all season, but that’s the kind of game Miami must win to make the playoff. So the question for Richt is less about talent—which Miami has in abundance—and more about rising to the occasion. And that’s probably not a question Richt can answer at media days. He’ll have to convince his team to answer it on the field. Follow-up question for coach Richt: Any more sandwich tips? The one from last year was tremendous. In honor of the one-year anniversary of Richt’s piece of sandwich—and life—advice, let’s rank sandwiches. This isn’t a ranking of specific restaurant sandwiches. These are sandwiches you can get at multiple restaurants or make yourself with ingredients purchased at the grocery store. 1. About a minute into this video, former Cal receiver Demetris Robertson says, “This is not a commitment video.” Spoiler alert: It’s a commitment video. The former five-star recruit from Savannah, Ga., will stay in his home state and transfer to Georgia. 2. Matt Hayes of Bleacher Report caught up with former Tennessee tailback and current Baylor receiver Jalen Hurd, who offered some vivid detail about his tumultuous final season at Tennessee and explained why he is making the transition from jumbo back to wideout. Hurd’s choice to leave Tennessee’s team in November 2016 has made him a villain in his home state—and would have been far less controversial had he finished the season—but Hurd seems at peace with his decision to leave and excited about what he might do at a new school and a new position. 3. If you missed SI’s series on the 20th anniversary of the BCS, now is your chance to catch up. • Here’s Joan Niesen on the always controversial computer rankings—and their creators. • Here’s Ross Dellenger on the Associated Press yanking its poll from the BCS formula. • Dellenger examines whether the Alabama-LSU rematch really killed the BCS. • Will McCollister ranks the best No. 3 teams of the BCS era. • Ben Ladner ranks the best title game performances of the BCS era. I know some people thought the dueling columns written by myself and Andy Benoit of The MMQB were some kind of WWE-style worked shoot. And while it’s true that we do occasionally plan point-counterpoint pieces at SI, this was not one of those. What actually happened is that I read Andy’s column and got righteously ticked. So I defended my preferred form of football the only way I could—with the kind of blazing takes that can only be written in July when nothing else is going on. If you want me to try your restaurant, here’s a tip: Make the menu as small as possible. No offense to the fine people at the Cheesecake Factory, but I tend to look askance at those who would make pizza and burritos and pad thai under the same roof. The fewer items on the menu, the more I trust you know what you’re doing. 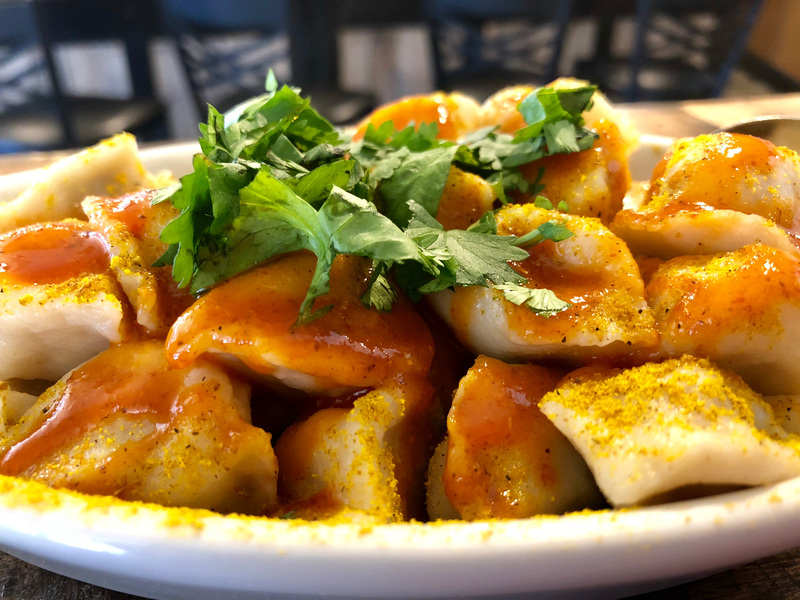 When I saw the menu for Paul’s Pel’meni, I was fairly certain I’d love this Russian dumpling spot tucked just off the State Street Mall in Madison, Wis.
As a service to you, dear reader, I will now publish the entirety of the Paul’s Pel’meni menu. That’s it. That’s the entire menu. The dumplings originated in Siberia, where the locals named the treat for its shape. Pel’meni is the Russian approximation of the words for “bread ear” in the language of the people who live in the Komi region in the Ural Mountains. The dumplings at Paul’s do look like adorable little ears. And if you’re not careful, you’ll eat about 100 of them. I ordered the beef-filled topped with The Works, and it took all I had not to get two more orders once I finished the first. The dumplings feel springy in the mouth; they’re just firm enough while simultaneously just tender enough. Biting down releases the beef into the mix, and then the beef and dough combine with the butter, curry and sweet chili sauce. The cilantro adds a fresh note just to make sure each supremely satisfying bite doesn’t feel too heavy. And while Paul’s food menu is limited to the one thing the place excels at, its draft beer selection offers plenty of variety to wash down all the dumplings. The place stays open late, and while I tried it at lunch on a random Wednesday, I can only imagine how effusive my praise might have been had I gotten a bowl of pel’meni after a night spent imbibing. The other thing that will bring me back is a negative that turned into a positive. I arrived just after Paul’s opened. There was only one other customer—a man waiting for a takeout order. The staff got to chatting with this customer and didn’t notice that I’d disappeared into the back room to wait for my order. When I returned to check on its status, Paul himself said “Did we forget about you?” He could have made up an excuse about how long the dumplings took to cook and hastily gotten my order out to me. I wouldn’t have known. Instead, he reached into the cash register, gave me back my $7 and told me these dumplings would be on the house. He didn’t need to do that, but because he did, I’ll make it a point to come for dumplings every time work takes me back to Madison.